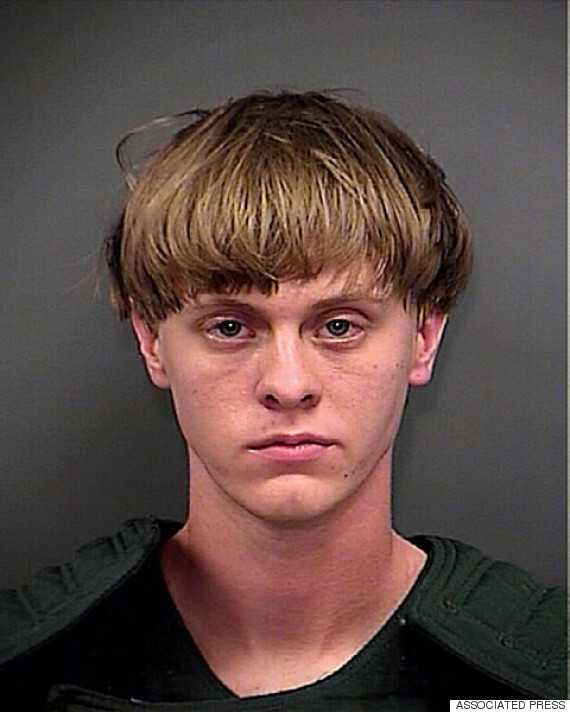 I don’t think I need to tell you, but Dylann Roof, a 21 year old white man from South Carolina, has been apprehended after allegedly killing nine black parishioners at a church prayer meeting in Emanuel AME, an historic black church in Charleston, SC. 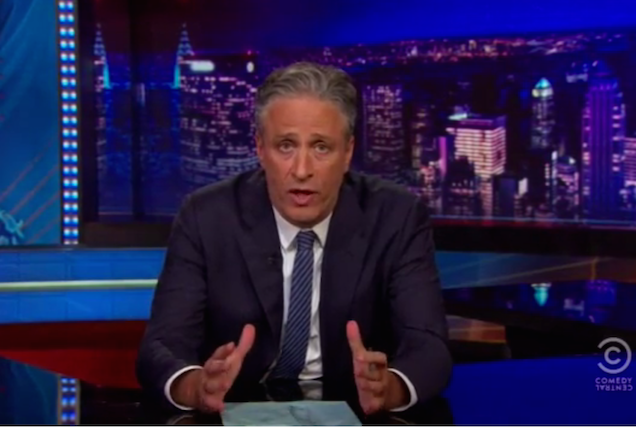 Fortunately, words didn’t fail Jon Stewart, who dispensed with the humor. He leaned down like a football linebacker and put his shoulder into the pile-in about race. And he got it right. Which probably shouldn’t leave me with much to say. But I’ll soldier on. The events of that horrible night are fresh in our minds, but already there’s a campaign a-brewing to label Roof’s actions as the work of a troubled loner. That follows an earlier, abortive campaign to blame victims, as brought out by Dr. Anthea Butler in this opinion piece: Cable news coverage of State Sen. and Rev. Clementa Pinckney, pastor of Emanuel AME who we now know is among the victims, characterized his advocacy work as something that could ruffle feathers. The habit of characterizing black victims as somehow complicit in their own murders continues. So now the fall-back position is that Dylann was just full of mental problems, was an unemployed drifter dissatisfied with his own life, another crazy young man with a gun. BTW, what father sees his basket case son (already convicted on felony counts) and thinks ‘I’ll get him a Gun for his Birthday! That’ll cheer him up!‘? Even pro-gun South Carolina gets all twitchy and forgets the holiness of the Second Amendment if you buy a gun for your convicted felon son. Dad may be facing charges as well. A couple years ago I was working on a project and I came across a trove of online pictures of lynchings in the US. If you didn’t know, Tuskegee University compiled records of US lynchings between 1882 and 1968 and came up with some 3,446 people of color having been killed(about 40 people a year). It’s apparently impossible to assemble records earlier than that, and the study ended in 1968, although (arguably) the killings did not. Some archivists collected photographs of the lynchings, which were popular postcard mementos over the years. And these incidents were not confined to the South; there’s a dandy double-lynching from Indiana in 1930. “ThomasShippAbramSmith“. Licensed under Fair use via Wikipedia. 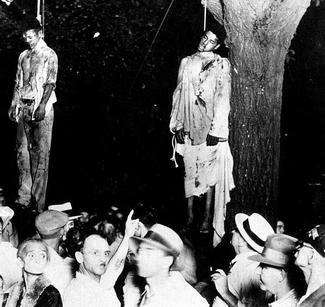 This is that famous lynching in Indiana. The people who put up the rope were engaged in evil, and we can argue that they were pathological. But what about the onlookers? They look normal to me (at least with regard to the times). You can go through the photo collection here and look at similar gruesome pictures. In most cases, if there’s a crowd, everybody seems celebratory–as if the camera has caught them at a summer church picnic. Appropos of this is a long-ago published profile of David Duke, Louisiana’s favorite Republican/Klan/Nazi political figure (a relative unknown in the 70’s). He made a bet with the reporter traveling with him: he promised that given a few minutes of chatting time, he could have any White person he talked to siding with his views. Time after time Duke engaged strangers on airlines, in lounges and bars, and at social events, and time after time, once he had managed to assuage the stranger’s natural reluctance to engage, he had them growing angry and spewing racist bromides that pleased Duke and appalled the writer. Not once did anyone call Duke out. Remember the amazing comedic bit from Eddie Murphy about passing as a white man? It feels more and more like a documentary. So let me wind this up. To me, it’s obvious that we are NOT ‘post racial’ (w-ever that ever meant). Racism in 2015, which is largely racism forever in this country, is about the melanin deprived among us politely nodding (or at best getting quiet) when other melanin-deprived ‘Muricans (friends, relatives, work colleagues) start mouthing off. And this isn’t about lame promises from SC Governor Nikki Haley promising to seek the death penalty in any trial (Hey, Nikki–why don’t you do something you have control over, like presenting a bill to the legislature to stop flying the Stars and Bars?). It’s about talking about the casual racism the better part of white America participates in on a regular basis. And how do you fix it? I guess there are worse places to start than the work of Tim Wise. He would be the first to acknowledge that, as a white man, he doesn’t know the black experience. But he’s also smart and astute about the ways that we Caucasians lie to ourselves about race and our own prejudice. And I’m waiting for him to blog about #Charleston. In the meantime, catch his twitter feed. Unlike many of our ‘seasoned’ newscasters and pundits, Mr. Wise has been willing to go where no one else would go regarding White America’s continuing refusal to deal with its racism. ← 10.03.2015: Does Earth have an expiration date?